The Masters Pimento Cheese Recipe - Better than Augusta National! 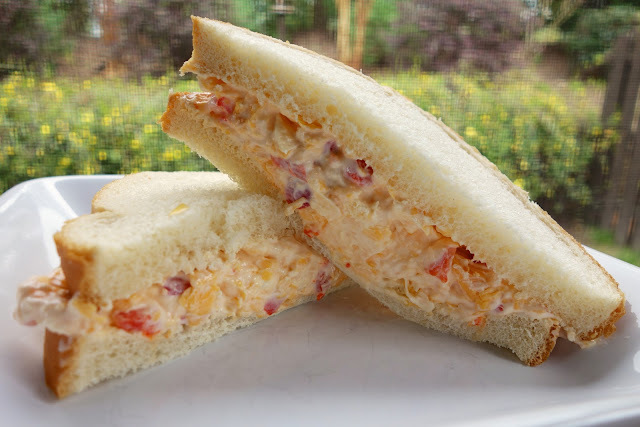 Get ready for The Masters with this delicious Pimento Cheese Recipe! SO good! Tastes better than the original. It's Masters Week! The Masters golf tournament is a big event at our house. Chicken Legs clears his schedule and watches the entire tournament. This year they are even televising the putting green and driving range. Masters overload! A few years ago we were lucky enough to get tickets for two days of the practice rounds. It was so much fun. The course is incredibly beautiful. One of the most unique aspects of The Masters is that the food and beverages are super cheap. Four of us ate lunch for only $20. That is unheard of at a sporting event. 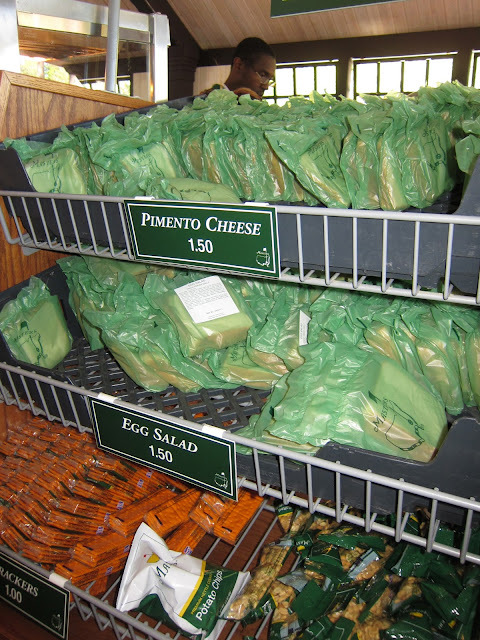 Pimento Cheese is very popular in the South. It is, in the simplest terms, cheese, mayonnaise and pimentos. It is served on bread, crackers, vegetables, or in sandwiches. I've even seen burgers topped with Pimento Cheese! The standard food at The Masters golf tournament is egg salad sandwiches and pimento cheese sandwiches. I have shared my kicked-up version of The Masters egg salad, so I decided I needed to give the pimento cheese a whirl. My version of The Masters Pimento Cheese turned out great!!! I used three types of cheeses in my pimento cheese - cream cheese, sharp cheddar cheese and parmesan cheese. It gives the pimento cheese SO much flavor. Feel free to swap the cheeses for your favorites. Pepper Jack or Gouda would be delicious too!! 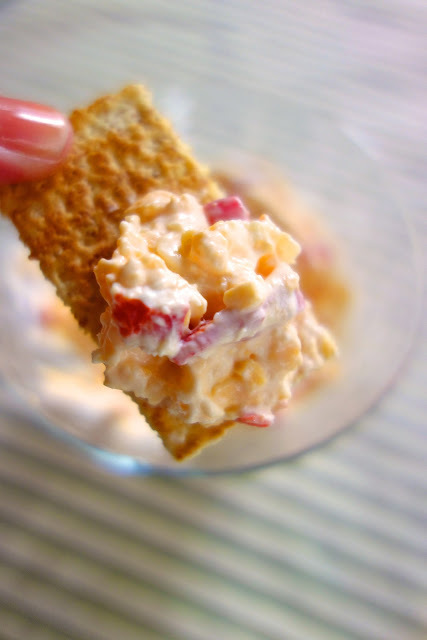 Pimento cheese is great for parties and tailgating. You can make it a day or two in advance and refrigerate until you are ready to serve. The Masters Pimento Cheese Recipe - Get ready for The Masters with this delicious Pimento Cheese Recipe! SO good! Tastes better than the original. Whip cream cheese until smooth. Add in mayonnaise, sour cream, and garlic salt. Whip until smooth. Cover and refrigerate 30 minutes, or until ready to serve. Sooo excited to try this. I LOVE pimento cheese but have never tried to make it. Ha ha! I posted about Pimento cheese this week too! Definitely a Masters tradition! My guys think they hate it but I sneak it in to everything! Yours looks good! You should try a pimento & bacon grilled cheese sandwich. It's next-level awesome. I LOVE pimento cheese on a hamburger! It's so good. I need to try your recipe. You're going to die when I tell you this, but I've never had pimento cheese, ever. I've only seen pimentos in a jar. Do they come fresh ? If they do,what do they look like ? Are they with the Mexican peppers etc? do you have to do anything to them before using them- like blanching, seeding or ???? Or do you just use a small jar for this ?? I'd like to try this I think !! Denise - I used jarred pimentos for this recipe. Enjoy! Stephanie, Thanks so much. I think I have a jar in my pantry ! Hubster is watching it, I would suspect he faked illness to stay home and watch, but the Dr's confirmation he has a virus proved me wrong. LOL. Great sounding sandwich Steph. I'd like to just ride around the course the day before golfing begins. The Masters - it's about golf not hosing the spectators to make money that none of the members or club needs - I like it. Greetings from Augusta! While I'm not a fan of pimento cheese or the Masters (or the traffic - ugh) I did find your site through Pinterest and can't wait to check it out! I am another Augusta who does not care for either Masters or pimiento sandwich. I think the reason food is so cheap at this event because it is crappy fast food. My pimento cheese recipe is a simple, southern one passed down. Cheddar cheeses, pimentos, and mayo...that's it. Let the flavors meld together. There's no need for additional salt or parmesan cheese with it's salt or cream cheese to make it creamy. You can't beat homemade pimento cheese. I've been meaning to tell you for a week that I tried your Fiesta Chicken Casserole last week and it was fantastic, a hit with the family. Did you drain your pimentos? Looks delicious! Kelly - I did drain the pimentos. Hope you enjoy it! How long can you keep this in the refrigerator? Elizabeth - I would say this would last at least a week in the fridge. Enjoy! Wow, best pimento cheese ever! I used to use Paula Deen's recipe (I think?) but had a bit too much garlic and onion. I was hesitant about the parmesan since I've never seen it in a pimento cheese recipe before...but it was fabulous! Thanks! Thank you so much for this recipe! I made it for my little girl's first birthday and it was a hit! I alter the recipe using Fire roasted red bell peppers, rather than pimento, grated asiago and cheddar cheeses, and fresh ground black pepper and chunky bleu cheese dressing rather than mayo on toasted bread. try adding ro-tel tomatoes...sooooo good! I add un-drained ro-tel, then add mayo and other ingredients as needed to loosen it up. This sounds good with sweet pickle relish added. The grilled cheese idea sounded great too! Thanks!